Building is completely reinvented here! 66 totally crazy building components unhinge the laws of construction analysis. More than a billion different construction possibilities provide the most audacious designs and completely bizarre structures: "Will the fir tree still fit between the egg cup and the napkin ring...?" Feel free to tremble - as long as your hands are steady. Besides a sensitive touch and the creative readiness to assume risk, you will also need a gambler's spirit and the talent of bluffing. By clever auctioning, you pass disagreeable building components as "poisoned presents" to your opponents. 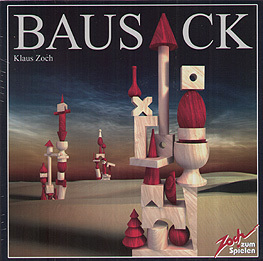 BAUSACK provides dazzling entertainment and a special tactile treat for the young and the young at heart.